乳腺硅酮植入物纤维被膜镜检时常可显示出屈光性硅酮材料，起因于这种材料渐渐漏出。可见异物肉芽肿性反应。并未显示其与系统疾病如自身免疫病相关。乳腺植入物周围的纤维化可能在某些妇女中引起变形与疼痛。被膜破裂不常见。 Microscopic examination of the fibrous capsule from a silicone breast implant will often reveal the refractile silicone material as shown here, because this material gradually leaks out. 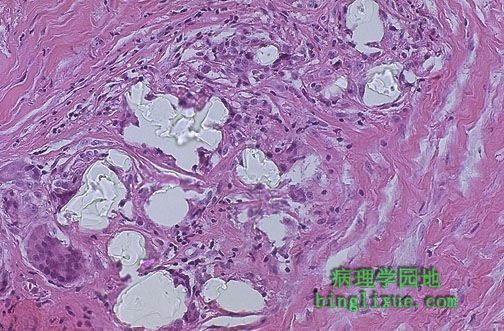 There is a foreign body granulomatous response. This has not been shown to be associated with systemic disease, such as autoimmune disease. The fibrosis around a breast implant may produce deformity and pain in some women. Rupture is uncommon.